(NAN) Chief Rotimi Akeredolu, born on 21 July 1956 in Owo in Ondo state, has been declared as governor-elect of the state. Akeredolu started his primary education at Government School, Owo, Aquinas College, Akure, and Loyola College, Ibadan and and Comprehensive High School, Ayetoro. He also attended the Loyola College and went on to the University of Ife (now Obafemi Awolowo University) to study Law, graduating in 1977. Akeredolu was among a crowd of aspirants to be Action Congress of Nigeria (ACN) candidate for Governor of Ondo State. On 28 July 2012, On Akeredolu was selected as the Action Congress of Nigeria (ACN) candidate for Governor of Ondo State. His selection pitted him in a head to head battle with the incumbent, outgoing governor Olusegun Mimiko and Mr Olusola Oke of the People’s Democratic Party (PDP). The Returning officer in the Ondo state governorship election, Prof. A. Ambali, has declared APC’s candidate, Mr. Rotimi Akeredolu, as the governor-elect. 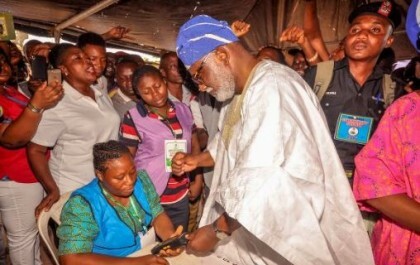 The All Progressives Congress (APC) scored the highest number of votes of 244,842 to defeat his closest rival, Chief Eyitayo Jegede of the People’s Democratic Party (PDP). The candidate of Alliance for Democracy (AD), Mr Oke came third with 126,889 votes. Ambali, who is the Vice Chancellor of the University of Ilorin, put the total number of votes cast at 580,887. The Returning officer called on all agents of the political parties to sign the final results as collated and announced. The results from the local governments are hereunder as announced. Meanwhile, Akeredolu has taken to his twitter handle to express gratitude to the people. He described the victory as the handwork of God through the people. It is not for me or the APC alone, it is a victory for the people of Ondo state irrespective of which side of the divide you stood during the election. He thanked the people of the state for their steadfastness. “I have heard their messages throughout the campaign to all the nooks and crannies of the state. Today, you have spoken with one voice. You have walked your talk. You have voted for me as your Governor for the next four years. “Today, Change has come. I hereby make a solemn pledge that this collective mandate shall address all issues with keen determination. The welfare of our people alone shall be the directive policy of the government. “Today’s victory is a confirmation of the willingness and readiness of the people of Ondo state to change and seek a better life. I thank you for your faith and confidence in me. I thank all those, whose uncommon sacrifices, contributed in no small measure to the success of the exercise. He will be sworn-in early next year.